Edward 'Longshanks' was the eldest son of King Henry III , whom he succeeded in 1272, having handled government affairs during the last few years of Henry's life. For much of his reign Edward was at war with enemies such as the Welsh, the Scots, the French and even some of his own barons. From 1277 Llywelyn ap Gruffudd led resistance in Wales until his death in 1282, after which Edward passed the Statute of Rhuddlan in 1284. This established the new counties of Flint, Anglesey, Caernarfon, Merioneth, Cardigan and Carmarthen, with government centres at Caernarfon and Carmarthen. 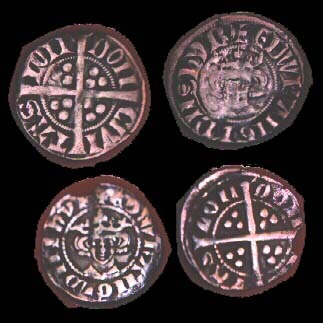 There were three rebellions north of the border during Edward's reign. The first was led by John Balliol, who had been selected King of Scots by Edward himself. Although he was a landowner in England, he bowed to pressure from his Scots advisors to rebel, and was defeated at Dunbar in 1296, handing his kingdom back to Edward. Rebellion continued under Sir William Wallace, who was defeated at Falkirk in 1298. The rebellion of Robert the Bruce outlasted Edward, who died while travelling north to suppress it. In 1294 Philip the Fair of France invaded Gascony, one of Edward's posessions, in retaliation for a naval skirmish off Brittany the previous year. Edward was able to send reinforcements and fighting lasted until a truce was declared in October 1297. Pope Boniface VIII arbitrated in the affair, and persuaded Edward to take as his second wife Philip's sister Margaret. The Gascon lands were not recovered immediately; this required a second treaty in 1303, by which Edward married off his son Edward (II) to Philip's daughter Princess Isabella. Far from improving relations between England and France, these intermarriages caused tension in France, where it was believed there would be an English claim to the French throne. Philip planned to blockade English ports and Edward responded by ordering 200 new ships and creating a unified command over them. The cost of these preparations revived opposition among the barons.